Is there anything such as a European blogosphere? A Eurosphere? Maybe a EUROspehre. “I don’t read your blog”, some of my German friends told me, “coz you’re blogging in English”. English isn’t my mothertongue, but hey, we have to start somewhere, and there are a lot of people around the world who write in English although it isn’t their mothertongue. With the recent elections in France that saw a very conservative candidate becoming the next President, one thing remains certain: national interest are still more important than European ones. There may be different historical and political reasons for this behaviour, however, the outside sees us – the Europeans – as a unit. More than we actually are. Something similar may apply to the African continent: whereas someone from Egypt or Morocco wouldn’t like to be called “an African”, the rest of the continent is still regarded as one big dark continent – by those who are not well informed. The European blogosphere, if there is anything like that, the European media, all those fancy Web 2.0 websites are orientated towards the USA. This isn’t bad. In fact, most Inet startups in Europe are 1:1 copies of succesful sites from the US. However, there’s the Atlantic Ocean between the USA and Europe. And between Europe and the African continent? A rather small Mediterranean Sea. Imperialists from European countries had conquered the African continent in the past and subdivided it into different countries, regardless of ethnical boundaries. Some of the main languages there are English and French, however, this European connection doesn’t seem to matter when it comes to intellectual stuff from the continent. So much about background information for those who still need to check the world map to see where Ghana or Tanzania are located on the continent. Having said this, let me pls introduce you to some fine African websites that have come up in the past. African, yes, as in Pan-Africanism. “Muti is a social bookmarking site inspired by reddit and Digg but dedicated to content of interest to Africans or those interested in Africa”. Muti is a perfect resource for the African content – and the obvious advantage of social bookmarking and why you would want to use it (and there are still a lot of friends who haven’t understood this): don’t waste your time combing the internet for interesting content but instead rely on that what others have already filtered for you. It’s like using Google with a human filter. That’s quality! 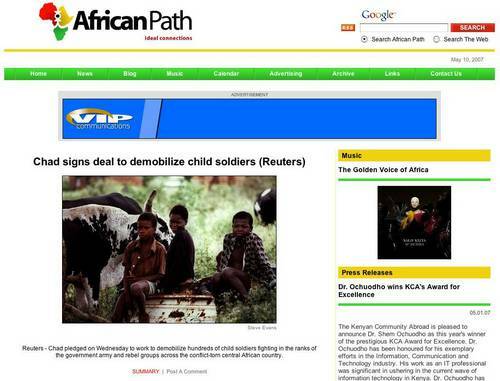 BlogAfrica also is part of Globalvoices, “a non-profit global citizens’ media project”. 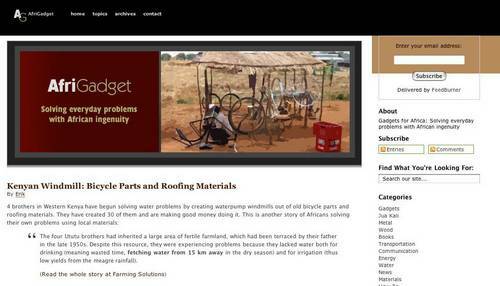 AfriGadget is another blog-styled website that tries to portray some neat technical solutions. Or as I would call it: the MacGyver solutions that come up in situations when your tools and materials are limited. If you think of solutions, and not problems – this is your site. (disclaimer: I am part of the team that contributes articles – want to join us?). 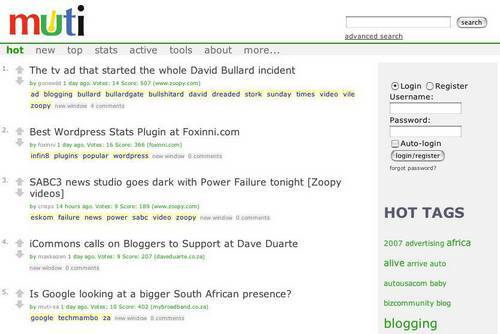 “AllAfrica Global Media is a multi-media content service provider, systems technology developer and the largest electronic distributor of African news and information worldwide.” (…) it…”is among the Internet’s largest content sites, posting over 1000 stories daily in English and French and offering a diversity of multi-lingual streaming programming as well as over 900,000 articles..”. 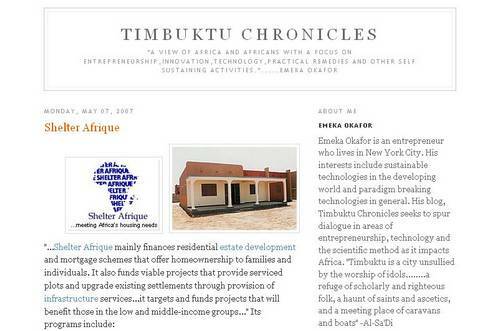 TimbuktuChronicles, a blog by Emeka Okafor on “sustainable technologies in the developing world and paradigm breaking technologies in general”. This blog is particularly interesting as it tries to highlight some sustainable technologies and business ideas which, I believe, have in the past and will also remain the driving forces for development in Africa. This isnt’t about some well-meant development aid by industrial countries, but about working solutions that put food on the table at the end of the day. There are of course many other interesting websites (this listing will never be complete), and while most of them are focused on a national level, we must not forget that I only mentioned those in English. How about the Francoblogosphere? As for Kenya – my 50% home – there are interesting sites like Mzalendo (a pretty interesting database on the Parliament of Kenya and its members and their outputs), Mashada (a community platform with a blog aggregator, forum, market place, etc. ), KenyaUnlimited (KBW, the Kenyan Blogs Webring with an interesting 400+ blog feed) as well as new start-ups such as Jahazi (an online application based on XML that enables its users to configure their applications, something like portableapps.com for the many users who are bound to internet cafés) and I just received an email from the brand-new Kenyan startup Nivipi, which claims to be a “Full Community Website” like MySpace for Kenyans. ALL of these aforementioned websites are a perfect example that WE EUROPEANS shouldn’t forget about that huge continent in the south of the globe, so close to Europe, which already provides many interesting and smart projects as well as intellecual property that shouldn’t be left out. Jke: Ahsante for truly and genuinely championing the cause of Africa and your second home Kenya… much appreciation dude! You rock! and waoh nivipi is such an interesting idea. 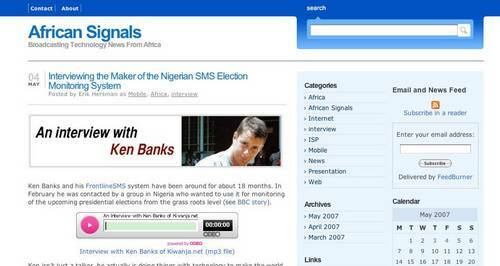 A kenyan myspace.Awesome! Thanks for this fine listing. The link to African Signals should of course be http://www.africansignals.com/. Great list JKE, and I appreciate the nod towards AfriGadget and newly-minted African Signals. Your point is heard loud and clear too. Great post JKE. 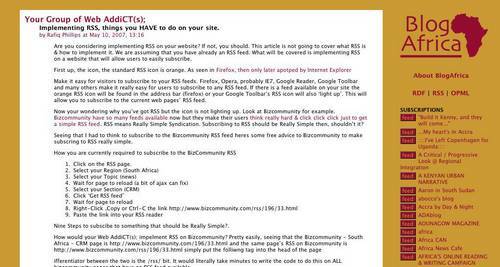 This is quite a comprehensive introduction to the world of East and South African blogs. A question: if we have a EUROsphere, does that mean that we also have an AFROsphere? And if so, does it have an afro? JKE, thanks for the post and it is well said. Our community is stronger and will continually be. Thanks JKE for that comprehensive list which I shall be checking out slowly. 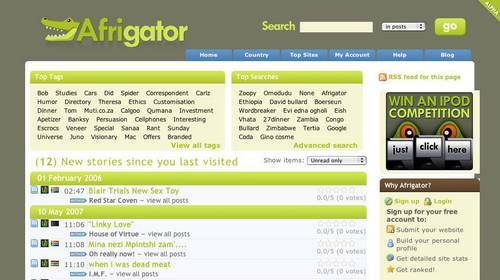 Have already scoped Afrigator and look promising. hey…trying out to move Kenyans to the web level…nivipi.com is great! I would like to register with you for free sms. your website has given me nothing but the best.keep it up. i would like to register with you for free sms. how do I? i wud realy like to enjoy uo free sms services. been trying to register but huh!waited for password rom u and failed,wazup? thanks and waiting 4 ua services. Heads up dude,all the time I thought i was informed lakini wapi…thanks man.NOW THE FREE SMS SERVICE BEFORE I TELL YOU I DNT EVEN READ IT!!! Am fend up with your empty promises of free sms.Nothing is free in this world. PLS NOTE THAT THIS IS A PRIVATE BLOG and has nothing to do with FREE SMS SERVICES in Kenya. HAKUNA =FREE= SMS! Thx. Any further comments on smseastafrica will be deleted. I think u r servies rock man keep it up i think africa is heading somewhere.